Lane Desborough is Chief Engineer for Bigfoot Biomedical. 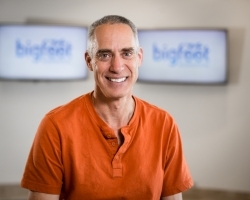 Prior to co-founding Bigfoot in late 2014, Lane spent two decades implementing and remotely monitoring automation in hazardous, complex chemical plants, mines, paper mills, oil refineries, and power plants all over the world. Lane’s industrial automation experience enabled him to jump immediately into the fight against type 1 diabetes when his son was diagnosed in 2009. He joined Medtronic Diabetes in 2010 and led the engineering team responsible for commercialization of the SmartGuard Predictive Low Glucose Management algorithm in the 640G and 670G. In his spare time while at Medtronic he co-created Nightscout and pioneered #WeAreNotWaiting.